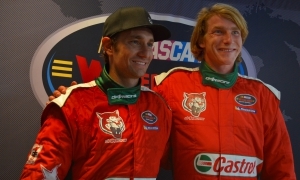 Daytona Beach, FLA - Forty years after their parents’ legendary duel for the 1976 Formula 1 World Championship, Mathias Lauda and Freddie Hunt will rewrite motorsports history books by not only being teammates, but by sharing the same car in the NASCAR Whelen Euro Series. Lauda will drive the #66 DF1 Racing Chevrolet SS in the Elite 1 Division and Freddie Hunt will take the wheel in the Elite 2 Division, adding further excitement to a season that promises to be breath-taking. 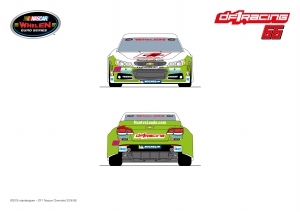 Mathias Lauda won the first ever NASCAR Whelen Euro Series oval race held in wet conditions at Tours Speedway in 2014 and notched a total of four top-5s and nine top-10s in 15 races in his first two NWES season. The Austrian, who is also an Aston Martin factory driver in the World Endurance Championship, will take part in his third Valencia NASCAR Fest. Four decades after his father won the Formula 1 World Championship, Freddie Hunt is entering his first NASCAR season with the goal to climb the learning curve as quickly as possible after a very positive first test and is sure that sharing the car with Lauda will benefit both in the hunt for glory in EuroNASCAR. 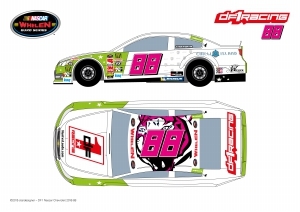 DF1 Racing Team also announced that they will bring back to the grid the hugely popular #88 Chevrolet SS by Euro Kart Racing Team with Simone Monforte and French rookie Alexandre Guiod at the wheel. The Austrian team is working on fielding a third car, the #77 Chevrolet SS, later in the season. The Valencia NASCAR Fest will take place at the Circuit Ricardo Tormo in April 23-24 and will be streamed live on Fanschoice.tv. Another chapter of the Lauda & Hunt book is ready to be written.